While we have talked about a great many possible variants of the new 2014 Chevrolet Corvette Stingray, the folks at Callaway are taking modification a step further with their upcoming 2014 Corvette AeroWagon Concept – a vehicle which could become a production reality if there is enough interest from the consumer market. As you can see in the image above on the right, the Callaway AeroWagon Concept features a unique sport wagon design that has become more commonly known as a “shooting brake”, applied to the great looking 2014 Chevrolet Corvette Stingray. The Ferrari FF has displayed very clearly that there is a market for a high performance 2-door shooting brake and based on the success of that four-seater Ferrari – Callaway has introduced their new AeroWagon Concept. The folks at Callaway have long made a name for themselves by offering ultra high performance Corvettes but none of them have ever been quite as extreme as the new C7 AeroWagon. There are no specifics known about the 2014 Corvette Stingray-turned-Callaway AeroWagon Concept but the company has designed a new rear hatch that the company states will offer unique styling along with increased cargo space. It seems that, unlike the Ferrari FF, the Callaway AeroWagon Corvette will not offer rear seats but the extended roofline should vastly increase the cargo capacities of the new C7. The company set out to design a rear hatch that would open to allow for plenty of access to the enlarged cargo area, calling upon their proprietary Resin Transfer Molding process to construct a large, one piece carbon fiber hatch lid. They appear to have succeeded in reaching that goal…although Corvette loyalists may dispute just how successful Callaway has been as turning the beautiful C7 Corvette Stingray into a wagon is considered beyond blasphemous by some. Callaway claims that they can offer the AeroWagon option to 2014 Corvette owners for “only” $15,000 and provided that there is enough interest from the consumer market – the Corvette shooting brake could become reality as soon as this fall. That is a pretty hefty chunk of change but considering how truly unique the C7 AeroWagon will be when it hits the street, this could be an ideal package for the older Corvette owner who wants more room to transport golf clubs or even luggage for a trip to the shore with his hot new secretary. 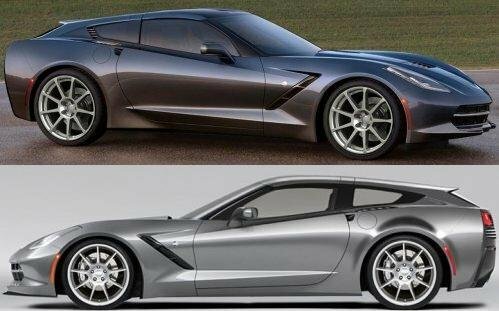 While this is likely to be a design that stirs up some controversy in the automotive world (especially in the Corvette world), it looks like Callaway has done a great job of applying the shooting brake design to the 2014 Chevrolet Corvette Stingray without destroying the look of the new C7. Sure, there is a longer roofline that makes the vehicle what it is but it maintains the slippery fastback design – albeit a longer fastback than what is standard on the new Stingray. Best of all, Callaway mentioned that with the modifications due (and currently unannounced) for the new Callaway C7 Corvette, the AeroWagon could exceed 200 miles per hour in this sleek sport wagon form. Of course, if there is low interest in the new Callaway AeroWagon, there is the chance that this shooting brake 2014 Corvette could go no further than the drawing board. However, I can most certainly see some recently divorced babyboomer who has money to burn being more than happy to fork out $15-20 grand so that his new Corvette loosely matches his prized 57 Chevy BelAir. This certainly isnt for every Corvette owner but they probably won’t need to receive too many pre-orders to make the AeroWagon Concept a production reality. This isnt something that I would do to my own 2014 Corvette (in theory – I do not actually have a new Corvette) but I have to applaud the folks at Callaway for their innovation. What do you think about the 2014 Corvette AeroWagon? Tell us in the comments! That corvette is sick, I love sport wagons and muscle wagons, and this makes one of my favorite new car, right next to the cts-v wagon. If they make the new 2015 mustang a wagon, that would make my year by how cool that would be, and screw who ever thinks otherwise, besides it a new car, not a priceless old car that would be ruined by modifying it.